My first chukker, I was so nervous thought I was going to faint. Once I got on the horse I was fine. She is a sweet gray mare, with no real name yet – maybe she will be named Susana! 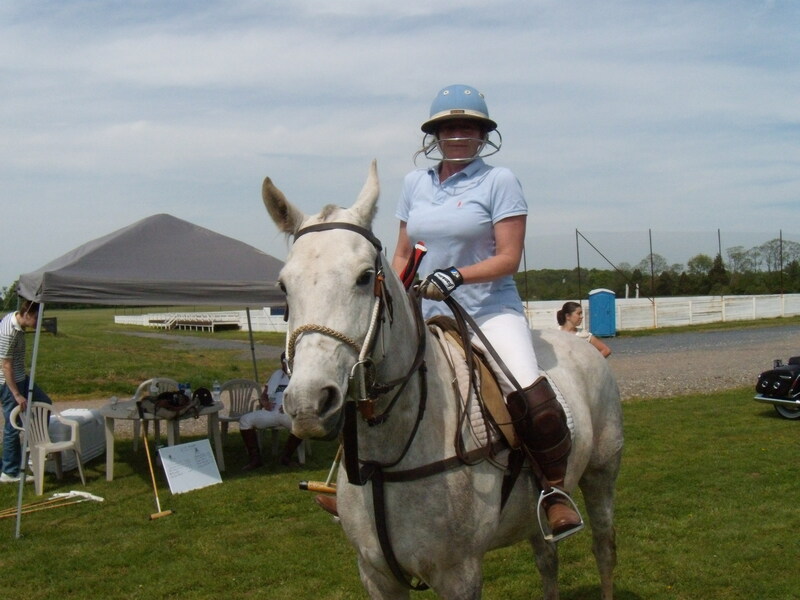 Being on a horse, on the polo field is nirvana for me. All of the ugly news of the world, the oil slick spoiling our coastline, falls away. I am worried about my riding first and my hitting second. Everybody was a bit green going into the first game of the season. It was a gorgeous May Day. Some of the horses were really fresh so we all took it really easy, which was perfect for me. Once we got going we started playing as a team. I had one goal assist. In the second chukker I rode Cannela, a beautiful gray mare. I scored a goal – it was really on the line, but they gave it to me. I sat the 3rd chukker down, and was grateful for the rest. In the final chukker I had a goal at the very end. I barely hit the ball, the horse kicked it forward, and I tapped it in. A very nice note to end on.